Strategist, Digital Activist, Social Entrepreneur, Government & Business Transformation Specialist. The 21st century is the century of cities. More than ever, human life revolves around the city. The world is undergoing the largest wave of urbanization with more than half of the population currently living in the cities. Additionally, the digital revolution is leading us to a hyper-connected world and a sharing society. Digital disruption and the 4th industrial revolution is coming, and it is coming at a rapid pace. It is critical that the African economy be prepared for this massive shift. Failure to meaningfully rise to this challenge means that we will relegate ourselves to just being consumers of foreign technology and services. African cities have a crucial leadership role in accelerating Africa’s participation in the new digital economy. Building open and agile digital smart cities in Africa becomes increasingly more important as we look to the future. Africa is also rapidly urbanising. At present, the African continent is 40 percent urbanised. There are currently 414 million urban dwellers – and only Asia has more city-based people. The continent’s largest cities all have populations of over a million people. Moreover, the continent is developing at an unprecedented rate: the United Nations Department of Economic and Social Affairs (UNDESA) predicts that Africa will be 50 percent urban by 2030 and 60 percent urban by 2050. Urban population growth in Africa is taking place at such a rate that – if there is not an adequate understanding of the situation, and if solutions are not developed quickly – the continent is heading towards a crisis of poverty, inequality and lack of resources for its city people. The UN's 2010 State of African Cities report observes that “experience shows that across the world, urbanisation has been associated with improved human development, rising incomes and better living standards,” but warns that rapid urbanisation can be more of a burden than an opportunity for Africa. The report states that “Socio-economic conditions in African cities are now the most unequal in the world”. This situation threatens stability, affecting not only the continuity of cities as socio-political human ecosystems but also entire nations. In many cases, there is in fact economic stagnation and contraction, yet city populations continue to expand and there are increasing demands on resources and increasing expectations of economic opportunity. The ever-quickening process of rapid urbanisation poses major challenges to African cities. There is no time to waste (with infrastructure planning for cities)”. Local governments, traditionally the public sector’s weakest link in most countries, are the ground troops in refocusing to emphasise not just service delivery but the city’s leadership and enabling roles especially in tackling poverty, social exclusion, economic development, safety and the environment. The World Bank points out that managing such challenges in the face of local and global economic pressures has been difficult even in relatively well-run economies. Cities have always managed to adapt to new challenges. Now it is the time to address the cities’ new digital ecosystem, to respond to the challenges faced by cities. New technologies allow the improvement of the citizens’ quality of life and a more efficient delivery of services by public administrations, in an environmentally sustainable way. Besides this, there is an opportunity to go beyond. The digital revolution should allow the City to be at the heart of a new digital ecosystem of innovation and entrepreneurship, expanding and transforming the information of citizens and organizations. Cities must provide a digital infrastructure, a platform for digital services. This will allow not only the provision of today’s services, but the development of new services by any provider or entrepreneur supported on a common digital infrastructure of the city. The city may thus foster a flourishing, creative, innovative and entrepreneurial digital ecosystem that will lay foundations for future economic growth. The city platform must be set up to facilitate synergies and ensure interoperability with other services and systems such as transport, energy, health, social services, etc. We need to encourage innovation based on an open platform and open data, promoting the city as a living lab for the Internet of Things (IoT) and a technology hub. Digital disruption and the 4th industrial revolution is coming, and it is coming at a rapid pace. It is critical that the African economy be prepared for this massive shift. Failure to meaningfully rise to this challenge means that we will relegate ourselves to just being consumers of foreign technology and services. The opportunity exists to create something that can meaningfully accelerate Africa’s participation in the new digital economy. 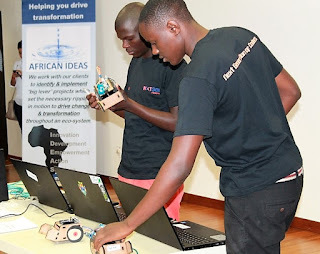 Something based on solving real world problems that have relevance to the majority of the world population - developing local (African) solutions, local IP, local economies, with global impact. However for this to happen, we need a different approach to the way that we have been tackling problems, and partnerships across society (government, private sector, academic and citizens) are critical. African cities have a crucial leadership role in accelerating Africa’s participation in the new digital economy. To do so, African Cities must promote an open innovation platform for the city, thereby generating the necessary scale and encouraging the creation of ecosystems in which the development of solutions arises not only from the city, but also from citizens, businesses and the academic sector. The intellectual genesis of the digital revolution was collaboration - people working together to pioneer technological breakthroughs that have allowed them to nurture their own imagination and ally creatively with others. This is the opportunity that awaits us if our African cities understand their key role as a platform for digital transformation. My mum has been in hospital for weeks. She was desperate to attend the wedding of my niece, Nisthal Sooful, who got married over the Easter weekend. We, the family, also wanted to make this happen. However, just before the event, the doctors informed us that it would be impossible for my mum to travel. She was devastated and there was a real danger of her sinking into a depression (which was not be great for her recovery). So, my brothers and I leap into action and decided that if she could not attend the wedding, we would bring the wedding events to her. This was no mean feat. There were 5 separate wedding events over 3 nights across 4 different venues (none of which had internet access). The events itself ran for hours. So we had to make a plan. For internet access, I took a Huawei B315 router with a Telkom LTE-A Uncapped plan. We also had phones with data sims from Vodacom, MTN, Telkom Free Me, etc. I took a selfie stick apart and merged some of the components with a camera tripod, so that we could use a phone as the main device to broadcast the event. The intention was not only to broadcast the events, but to allow people at the various events to interact with my mum (almost like she was at the event). The good news is that we managed to make it work. The main technology that we used was Skype, but at times we had to switch to WhatsApp video (not the best quality, but worked when connectivity was bad), and WebEx (when all else failed). Connectivity had to be good on both sides. This was a challenge as the hospital room that my mother was in was in a poor reception area. My brother Sunil, had to put her in a wheelchair and go around looking for a good signal. In Kwazulu-Natal, we only had problems at the venue in Hillcrest. However, as this was the main wedding event, we had to make it work, and we did eventually succeed. Power was extremely important. Streaming hours and hours of video drain the battery life of phones relatively quickly, so you need a power connection. Phones worked very well to broadcast the event. We had a fancy video conference unit that could be setup on a laptop, but the phones ended up working the best. It was portable when we need to take the call around to people to enable them to speak to my mum. For broadcasting the event, a phone on a tripod produced an extremely high quality video feed to the computer on the other end. Phones also helped make us relatedly unobtrusive (so as not to get in the way). Headphones are important, as events are noisy and if you want to talk to people on the other side of the video, you need headphones. You also need a separate phone on both sides to communicate while you are getting all of the logistics right. Also technologies like WhatsApp becomes invaluable as you often need to tweak settings, but cannot speak while the events are happening. People of all ages took to the technology. 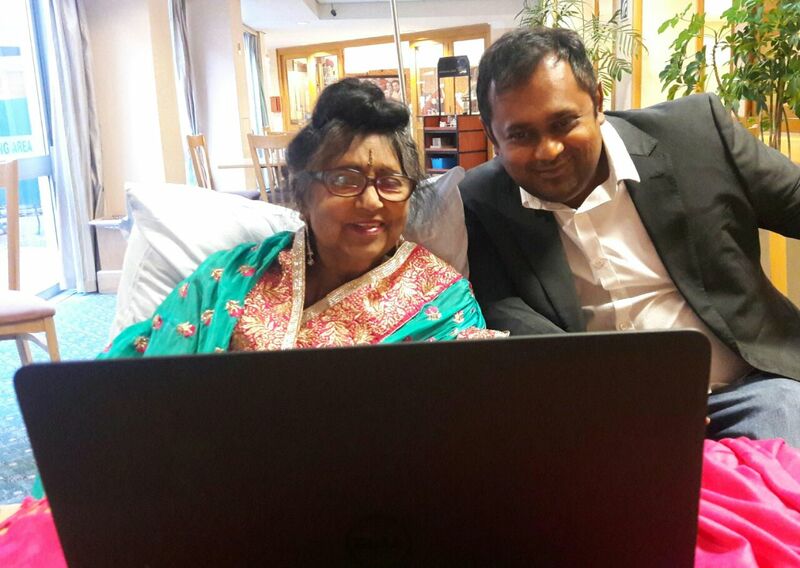 I was surprised that people in their 60s and 70s at the event where quite comfortable using it to speak to and interact with my mum in Cape Town. All in all, it was a very successful endeavour. My mum got to see all of the wedding events, she got to speak to people every day at the various events, and in part, felt like she was a part of the wedding. 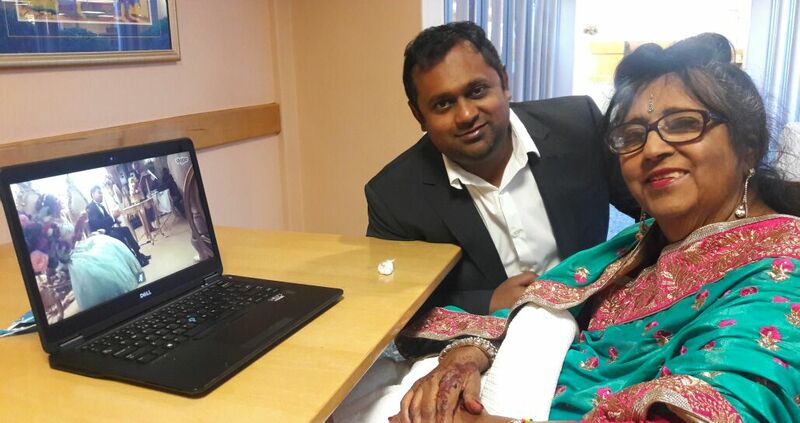 It was really great for us as technologists (and sons) to see that we could make an old lady’s dream come true via technology even when she was physically not able to travel. This video clip gives a glimpse into the 3 days of wedding festivities. So I see that the latest crime stats were published yesterday. In the last 24 hours, there have been many articles, graphs and infographics produced from these stats for newspaper articles, websites, etc. The challenge with these is that it focuses on the headlines and does not give people the information that is meaningful to them. For example, this morning someone in the office mentioned this article "Cape’s safest and unsafest areas" and wanted to know "but where does my area fit into this picture?". Fortunately I have found at least 2 websites (there might be more) that provide an answer to this question. 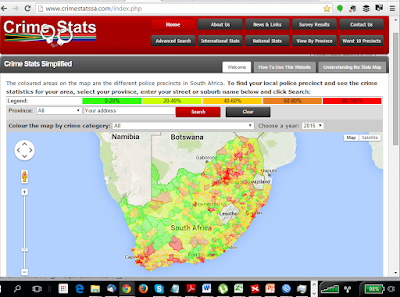 The two websites are www.crimestatssa.com and https://www.issafrica.org/crimehub/map/. The ISS website also has a lot more infographics, videos and other resources - but I guess that this (crime) is their business, so one would expect them to have this information. I was more interested in the www.crimestatssa.com one as this appears to be a private initiative but also seemed to more easily have the information that I needed. I could not understand from the website exactly who is behind this initiative other than it is run by Meerkat Data Management. When you get to the site, you see all the police stations mapped across the areas (precincts) that they serve and this is colour coded according to the severity of crime in that precinct. You can then enter your address and it will take you to a view of your precinct. I chose Woodstock as that is the police precinct that I live in (although you do not need to know that. You can just type in your address). As you can see from the above picture, I live in a high crime area. 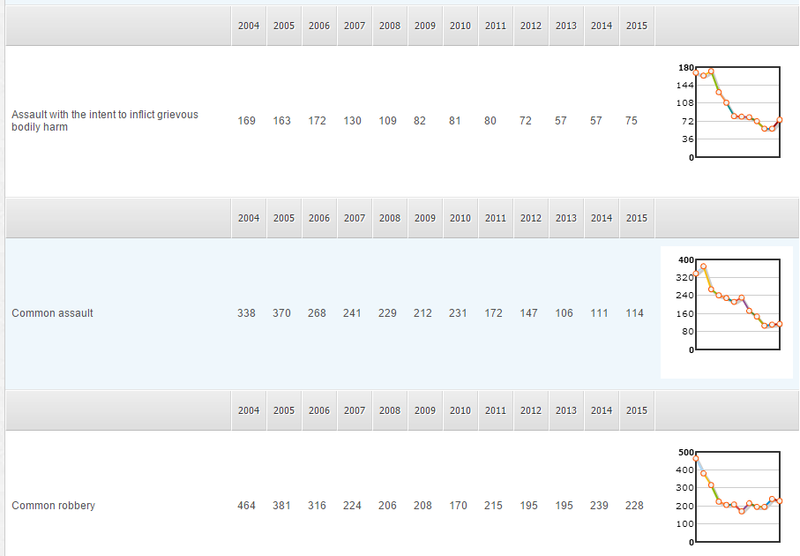 Then you can click on the link and it takes you to the details of what makes up these statistics and provide you with a view of that data over the last 10 years. The picture below is just a sample of the various categories that is reported on. 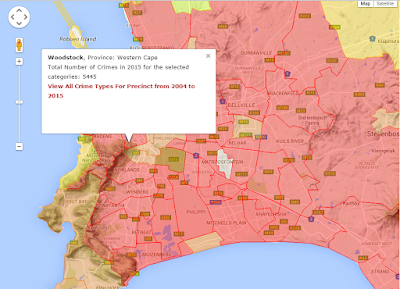 I assume that this maps back to the way that SAPS categories the crimes. So I can see that in my area "Assault with the intent to inflict grievious bodily harm" incidents have increased from 57 in 2014 to 75 in 2015. 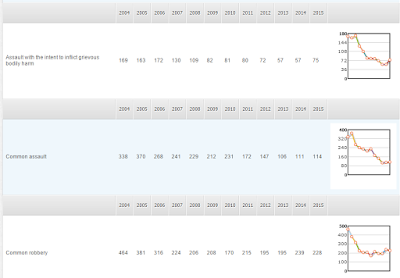 I must say that I found this site to be incredibly useful in making the crime stats information more relevant to me as a citizen. More importantly however, both these platforms demonstrates the power of open data. These platforms have, in less than 1 day, taken the crime stats information made available from government, and put it on a comprehensive map based platform that displays the information in a more easy to use (citizen focused) format. This is what open data is all about. It government just puts the information out there, people will find uses for the information in ways that make sense to them. Government does not have to be putting huge cost and effort in building systems that will display this information, etc. It just needs to make meaningful data available - hopefully in a format that is usable. 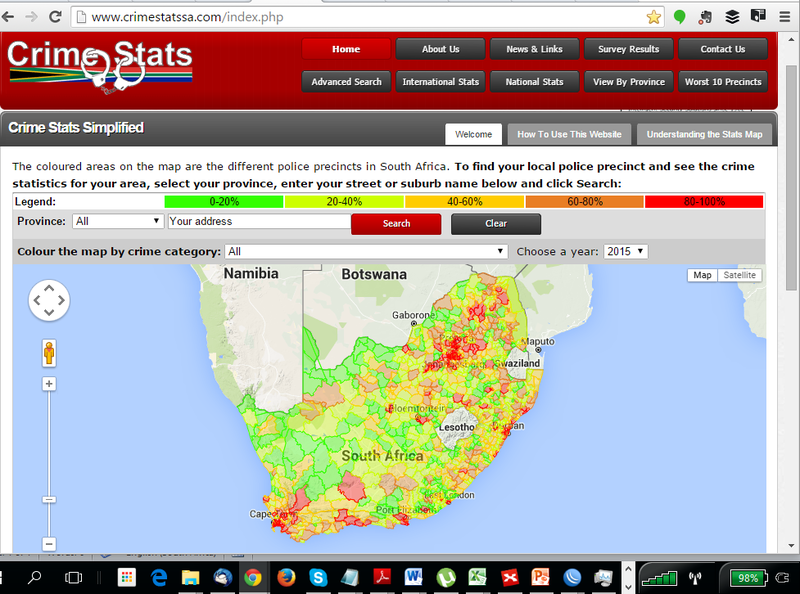 In this case, SAPS just made the data available in an Excel format (http://www.saps.gov.za/resource_centre/publications/statistics/crimestats/2015/crime_stats.php). I think that this is a good example of what is possible when citizens have access to the data. There is much more that can be done with this information to plug the information gaps that we have. This is a good start. Government needs to be encouraged to make more and more information open in formats that citizens and businesses can use. Open data is an incredible resource that can help us grow our economy. Examples such as this help us build the case to encourage government (National, Provincial and Local) to embrace open data and the potential of a truly connected society. Cape Town as a leading Digital City - reinventing the wheel? The Western Cape Broadband deal signed with Neotel is a truly ground breaking initiative that will have a profound impact on the Western Cape and the rest of South Africa. As part of the project, Neotel will provide connectivity to over 2 000 sites across the Province comprising a mix of government buildings, schools, healthcare institutions, libraries, as well as administrative offices of the WCG to provide connectivity across the Province. The project will be divided into phases to ensure speed of delivery with 982 sites connected with speeds of 10Mbps by April 2015 and all 2000 sites will be connected by May 2016. By August 2018, most sites will be connected with fibre and 90% of sites will have 100Mbps speeds and 10% with 1Gbps and above speeds. The entire agreement is over a 10 year period. This project will result in fibre infrastructure being deployed to every municipality in the province within two years, and every ward in the province over 10 years. I will soon write a more comprehensive post about the significance of this deal to the country and how it links to the national South Africa Connect strategy. However the point of this post is to provide some recognition for the unsung heroes, without whom this initiative would not have seen the light of day. I am referring to Jo-Ann Johnston, Olivia Dyers and the rest of the broadband team at DEDAT (Department of Economic Development and Tourism) Cape Catalyst Unit. These are hardworking civil servants who have spent 4 years of their lives making this project happen. 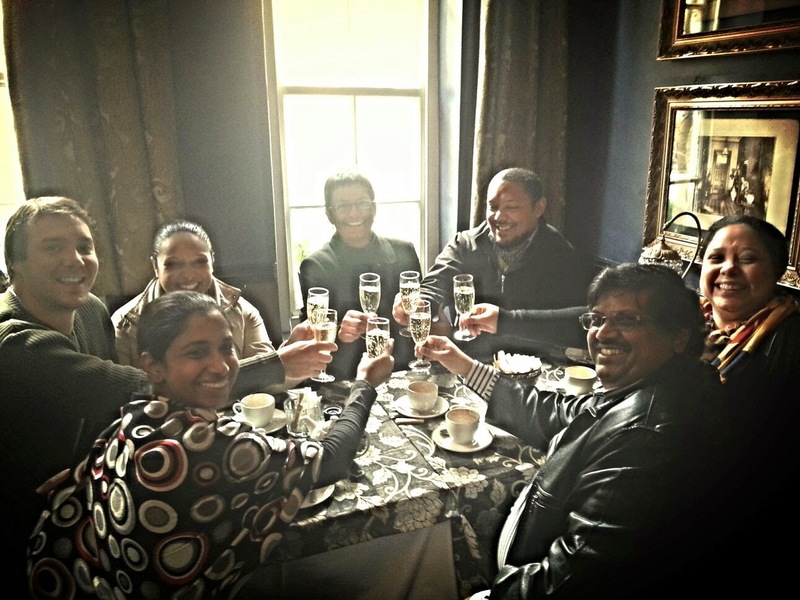 Without them, the Western Cape would not even have a broadband strategy. They initiated the broadband strategy with the creation of the Western Cape Telecommunications Position Paper which argued that the WCG needed to do something to speed up the development of broadband as a key economic enabler. This led to the WC Broadband Strategic Framework and Integrated Master Plan, via a process that they drove. The provincial broadband PPP, the PWAN (which culminated in this deal with Neotel), the e-Education vision, public WIFI, the Khayelitsha, Mitchells Plain, Saldana Wifi mesh projects, Bandwidth Barn Khayelitsha, E-Skills Platform and Digital Content Development Ecosystem, etc. are all projects that have stemmed from this strategy and this particular team. “Never doubt that a small group of thoughtful, committed citizens can change the world; indeed, it's the only thing that ever has”. It is good to still find civil servants who still believe in making a difference. This is becoming a rare commodity in the public service these days as compliance and risk averseness have become the order of the day (this will have to be the subject of another post). It is an extraordinary group of people who will fight for what is right rather than doing what is easier or more popular. They don’t do it for the recognition nor for the remuneration (as they get neither). They do it for the impact that they will have in society. They do it for the citizens of this country. I also think that this other quote by Harry Truman is also very applicable to this team. I am really privileged to have worked with this talented team of people. This province and country are richer for having individuals such as this in the public service. Jo-Ann and team – Congratulations on a job well done. The impact of what you have achieved will resonate with future generations in this province. Below is the video produced by Jo-Ann and team on the Western Cape broadband strategy. 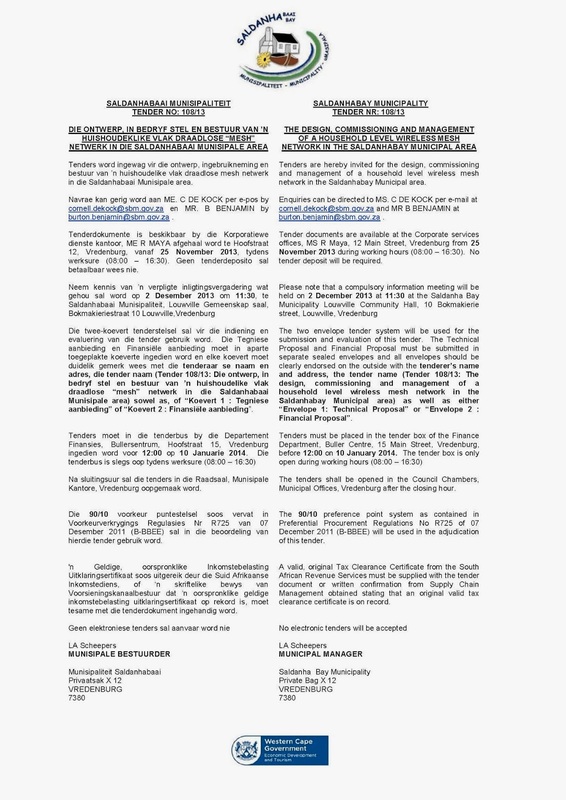 It shows the plan and this contract with Neotel shows how the strategy is being implemented. Also see http://www.cnbcafrica.com/video/?bctid=3638537551001 for an interview with Sunil Joshi, CEO of Neotel on this deal. 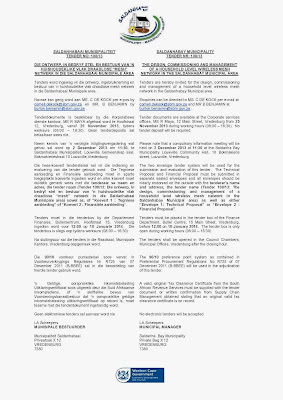 The advert for the tender for the design, commissioning and management of a household level wireless mesh network in the Saldanhabay Municipal area was published in “Die Weslander” and the municipality website (http://www.sbm.gov.za/tenders/run/data/files/Tender108-13.pdf) today. A copy of the advert is reproduced below. This is a very exciting development for South Africa. It is the first time in this country that a project of this nature is being attempted. I will elaborate further in future posts if time permits. However, suffice to say that the biggest gap with respect to access to affordable broadband services in South Africa is in the access network. We raised this issue as part of the Western Cape broadband initiative and it is great to see that this aspect has also been highlighted in the new (much improved) national broadband policy document from the DOC. We proposed pilot wireless mesh networks for Khayelitsha and Mitchells Plain (to test urban, metro) and for the Saldanha Bay Municipality (to test a more rural, less densely populated area). It is great to see the projects coming together and I am sure that we will learn a lot from them. It is important to note that these projects aim to provide coverage right down to the household level. It is at a very different scale from the many other WIFI hotspot projects that have been in the media recently. African Ideas recently partnered with SAP to bring their global Urban Matters programme to Africa and specifically Cape Town. The African Urban Matters event in Cape Town was held on the 14th and 15th November as a knowledge sharing platform for administrators and leaders in Local Government organisations involved understanding and planning for these African cities of the future. At the end of 2010, just short of 40% of Africa’s population lived in cities, making it one of the world’s least urbanised regions. This figure is set to increase dramatically in the coming decades. At present, sub-Saharan Africa is second only to Eastern Asia in terms of the pace of urbanisation, with estimated annual growth of 1.26% from 2010 -2015. By 2035, the continent will reach a tipping point, when more than 50% of Africans will live in urban centres. By 2050, more than 1bn people will live in cities. In 2010, there were 94 sub-Saharan Africa cities with a population of more than 500 000 inhabitants… and in 2025 there will be 144 such cities. So issues of urban management is very important. Nirvesh Sooful is the CEO of African Ideas (www.africanideas.co.za), a strategic consultancy that he founded focusing on helping governments to accelerate the benefits of ICT enabled change through transformation of the public sector and the wider economy. Nirvesh has more than 25 years’ experience in the ICT industry and has been involved in many large, complex, innovative and often controversial projects.This blog is maintained in his personal capacity and does not necessarily represent the views of African Ideas, its staff and its partners.